It happened around 9:00PM, almost two years ago: I came around the corner carrying the last of my possessions from my old place to find, to my horror, fire trucks up and down the street, which was awash with water and fire suppression foam, and lined along the sidewalk with spectators from mine both and surrounding buildings. The blaze, thankfully localized within my building (and thankfully nowhere near my unit), was caused by excessive dust in an air exchanger in the laundry room, which caught and burned a portion of the ceiling. Despite this, I didn’t believe this most recent fire alarm signified a real fire, or at least not one large enough to destroy the building. The walls of my building are paper-thin, so I often hear smoke detectors going off around me; no doubt a consequence of my living in a smoking building – perhaps one of Vancouver’s last remaining, wherein, as a result, almost EVERYONE (myself excluded) smokes. Plus, I live in Vancouver, so cigarettes aren’t the only thing folk are smoking all up in here. Hearing that Saturday fire alarm, I suspected someone had let their ciggy or bud burn a little too long to the point that their smoke detector activated the central alarm. However, the prudent part of me (that small portion of the prudent part which hadn’t been stupefied by a rainy Saturday afternoon) said it wouldn’t hurt to grab a few belongings to take outside with me, just in case. I was right about there not being a fire. Rather, an issue with the exhaust vent on a dryer causing it to vent inward instead of outside had set off the building’s heat detector. That said, I do fully expect some careless smoker to level this place some day (hopefully long after I’ve moved on). Having now experienced a fire alarm has got me thinking about what I’d want to save in a real fire. Fires tend to happen at a moment’s notice, leaving no time to be standing around wracking one’s brain. Hence I’ve made a series of lists of my most valuable possessions and the relative importance of rescuing them if time and my ability to carry things is limited. Even though I hardly play anymore, this would make me very sad. I’m super-paranoid about losing writing-related possessions to disaster, for I’m reminded of historical fiction writer Sharon Kay Penman, who had a completed manuscript stolen from her car. As this happened in the 1970s during the pre-electronic, pre-digital backup era, Penman was forced to rewrite the entire novel. Were I to lose my WIP, I don’t know that I could rewrite it, it’s so much a product of who I am right now and what I have to say at this very moment. In any case, I certainly don’t want to put a rewrite from nothing to the test, my attention to disasters instead being that of prevention and preparation rather than mitigation. What would you try to save from a house fire? Writers, do you worry about your work being lost? How do you prevent this from happening? Let me know in the comments. This entry was posted in Lifestyle, Writing and tagged Apartment living, Apartments, Disasters, Fire, Historical fiction, Important belongings, Novel, Novel writing, Research. Bookmark the permalink. I have been in a fire. It was in a basement suite that I was sharing with my sister at the time. I was 18 years of age. That I escaped with my life is what I am most thankful for. I spent 3 mos. in the hospital and required skin grafts. If you are in situation where you have to get out…just go. As much as you may lament the loss of a story you were working on, the story is still in you to be told. You can’t tell it if your dead. Fires move frighteningly fast. It wasn’t so much the fire itself but the lack of oxygen that likely would have gotten to me first. I was holding the door handle, not aware that I was being burning by it and just pulling as hard as possible the pressure refused to allow me to escape. My lungs were on fire as I tried to get some air in them which was non-existent. Then with a woosh! the door opened and I ran out with flames chasing me out the door. Next I recall rolling on the grass, still very much unaware that I had sustained serious injuries. So don’t worry about the laptop. If you are that concerned about your work I would suggest putting it on a flash drive and putting it in a safety deposit box. Switch it up every couple of months. Keep important documents in there as well. Your passport perhaps, long version of your birth certificate. The cost in minimal to do tis and will provide that peice of mind that in the event of disaster, you only have to worry about yourself. If you can grab your purse…sure go for it. Everything else can be replaced. You can;t.
Wow, Nancy – what an amazing story. Fire is hideous, my brother-in-law was burned in a sugar cane fire many years ago and is badly scarred. You’re right, just get out – everything is replaceable but you aren’t. Nancy, that’s a horrible story; it must have been awful for you. Of course, I would never do anything to endanger my life and would always pay fire the proper respect it’s due. 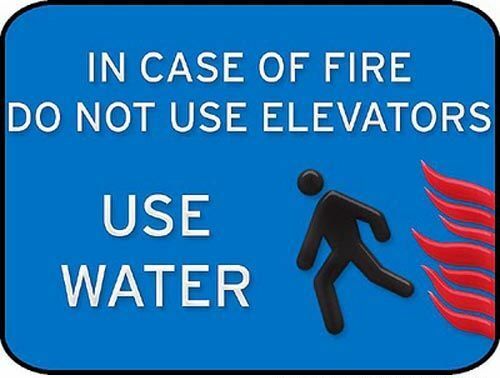 This post was written tongue firmly in cheek after my dazed experience with the Saturday afternoon fire alarm. I’ve been paranoid about fire since I was a kid, even though we never experienced one while I was growing up (I like to joke it’s because I was technically born under a fire sign but I more so identify with the water sign that precedes it). I’ve actually made a point of considering several escape routes out of my apartment should a real fire ever happen. I’ve done this in every place I’ve ever lived, and once I found out my current place is a smoking building (moments before I was set to sign the lease!) you’d better believe it was one of the first things I did upon moving in. Plus, I do keep a USB drive with all my writings at my office locked up on my drawer, and switch it on a weekly basis with the one I always carry on my person when out of doors. So I’m well set. I’m glad Nancy already gave you what for! But yeah, the flash drive, at least. I know the drums would be a write off, and probably the guitar too. Wallet and flash drive with my WiP. And my car keys. They’d all fit in the embarassingly overpriced manpurse I bought the other from the Coach outlet. Brilliant idea for when we’re both millionaires: A home office built into a giant walk-in fire safe, which is built into your house. As soon as the alarm goes off, you exit, hit the red botton, and it self-seals. Then you wait outside for the firetrucks, knowing all the important stuff is protected. Sure, you need to replace the sofa and kitchen table, but they were getting beat up anyway. 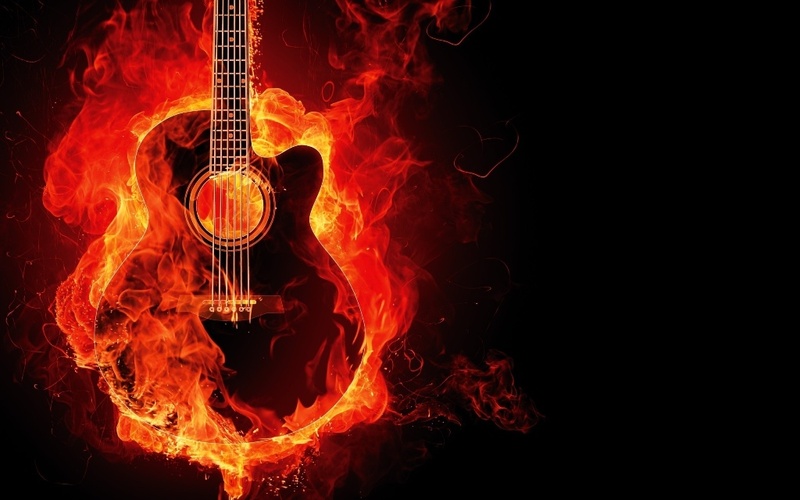 I’d still be sad if my guitar burned. She and I have had some good times. I would never do anything irresponsible or put myself in danger. I would grab my external hard drive, but I have to pass by where it rests on my way out the door anyway (my apartment is very small), so it wouldn’t delay my escape. I’ve thought about this a lot, not exactly a fire situation, but earthquake situations. And I have left my building several times. I grab three things, my laptop, my purse with ID (important when you’re living in a foreign country, which I usually was) and my cell. I figure if I have those three things, I’m good or everyone else is just as bad as me. Usually my purse is sitting next to my laptop with my cell in it. It takes me literally one second to grab. I keep a complete backup of my computer on an external drive as well and I have backups of large finished projects in my email account. I’d worry about it being hacked, but at this point, there’s so many people giving away stories for free and I’m not famous, why would anyone want it? They’d just have to do all the marketing work for me to make money and then I could take them to court and get it. At this point I do not keep written notes of my WIP’s, except for mind maps, which have mostly fulfilled their usefulness by the time I’ve finished making them. They help me think and then everything ends up in the world building file, which is searchable in Scrivener. That necklace is actually very pretty; I could see myself wearing something like that! But if you’d prefer a choker style, that might be a good business venture for you, selling to paranoid writers the world over. Hello Etsy page! I do keep a USB drive with all my writings at my office locked up on my drawer, and switch it on a weekly basis with the one I always carry on my person when out of doors, so unless the device failed, I wouldn’t be totally screwed. I too have been trying to phase myself out of keeping written notes. The notebook in my purse is somesix years old, which I’m working my way though as I come to the relevant scenes. Most of my new notes are recorded on my phone or iPad. I just haven’t been able to get away from the bedside notebook, for firing up my phone or iPad (no pun intended) in the middle of the night is too hard on my eyes. I should probably transcribe these nocturnal musings if I’m not going to be making use of them within a day or too. Etsy store, now there’s an idea! You sound like you’re pretty well protected. At your very title my eyes widened and I rushed to back up my m/s to Dropbox. (E-mailing is a trick I hadn’t thought of).The preferable option to a re-write would be to, like, kill myself. Thank you for the reminder Janna. Roy, I’m glad my post encouraged you to back up your writing. You don’t want anything to happen to that! For the record, I’m not a smoker, nor have I ever smoked in my life. I didn’t even realize this was a smoking building until moments before I signed the lease. I hesitated for half a second, and then naively thought to myself, Who really smokes anymore anyway? Boy, was I wrong? A lot of people do smoke outside because I see or hear them on their balconies, but I know not everyone does, because the hallway often stinks of smoke or Mary Jane. I found you courtesy of Eric. I like this post because it forces us to think logically in the absence of real danger; like a drill if that time should arise. Once there was a wicked gas leak in my home. I dialled 112, reported the situation, and ran out with only my house keys. Adrenaline from fear can do this to you. Outside, after emergency services had arrived, a policeman taking my statement asked me for my ID. I gave him the evil eye, and asked him to go up to my bedroom and get it! Hello livelytwist! Thanks for the visit and comment. Yes, that Eric is a good connector. I will be by to visit your blog soon too. I seriously hope I never have to live through a real fire (or gas leak; nor do I want to die through any of those either), but even as a kid I’ve always questioned the wisdom of just running out with nothing like they taught in school. At the very least, a few necessities can’t hurt – shoes, a jacket, wallet, keys, more if there is time. Obviously, I wouldn’t put myself in undue danger – I wouldn’t walk through smoke or fire or open a hot door or anything – but if my house is going to get torched to the ground, better to not have to rebuild my life from absolute zero.